Today I had to put my workout off until after work. My sister was flying back into town from a work trip and we needed to pick her up at the airport. It was nice getting a chance to see her randomly during the week, even if it was fairly brief, so I gladly put off the workout. I will say, sometimes it's really hard to find that energy at the end of the day. All I really wanted to do was go home and be a slug. Yes, I really can be a slug I promise! But, I had a date with back and shoulders and I'm not one to back out of a scheduled plan. For the past few weeks I've been doing two sets of supersets at 4 x8 with dropsets at the end. Today I went that route again. Next week I'll probably do away with the drops though as I have read that they are good to incorporate, but not to use them all the time. It's good to shake it up either way. I did add in 3 sets of 10 reps of low back extensions as well (on my list of PT exercises to do). You chose 8 exercises. You do each exercise for 20 seconds full out, rest 10 seconds then move to the next exercise. At the end of the circuit (after all 8 exercises) you rest 1 minute then repeat for whatever length of a workout you're after. Basically each round is 5 mins. I did this 3 times and was done! I'm slowly adding back in the plyo (higher impact) exercises and man oh man I was sucking wind! And I'm still loving kettlebells. I wish my gym had kettlebell classes. I think that would be lots of fun. All we did was saute some green bell peppers, onions, garlic and seitan and then stir in BBQ sauce for BBQ Seitan Sandwiches along with baked sweet potato fries (I know you're shocked by the fries right??). Since dinner isn't much to talk about, I thought I'd talk a little bit about running. I was inspired by my friend Jessica's post yesterday - Why I run: Today. It really got me thinking about why I run now vs why I ran before (like when I first started running). I never really documented my running evolution actually. Basically, I started running for the cardio factor. Plain and simple. And I hated it. I always ran on the treadmill. Stuck inside. Hot. Miserable. I was too scared to take spin class and sick of at-home DVDs. Jason eventually convinced me to run outside with him. I'd do about 3 miles and that was good enough. We ran fast. I thought too much. I planned out every second of the day. It was painful. But it was less miserable than the treadmill. In fact, I was kind of starting to like it in a weird way. I think it was being outside and spending time with Jason. Eventually I started running around the neighborhood on my own when Jason didn't feel up for a run. One day, I picked my head up, looked around, stopped planning out every second and all the sudden I was in love. I noticed things I'd never seen before. It was an epiphany. I ran 50 minutes straight that day and was beyond proud. I couldn't stop beaming. It was probably the proudest moment up until my first half marathon. So, now...why do I run? I run because it is a release. I can run off all my problems. Even if it's temporary, it's pretty much the only time I'm not thinking, thinking, thinking. 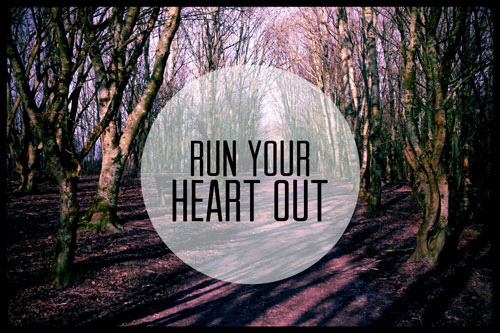 I don't worry when I run. I don't fret, stress, or fear. Running makes me feel strong, accomplished, beautiful. Running makes me happy plain and simple. So, if you're not a runner, maybe this can help you understand what it means to me. Why I was so desperate to get back to running after my sidelining injuries. I felt out of sorts, unsettled. I have people asking why I am upping my miles. People that are legit concerned of course. But I NEED to be out there. I want to be out there. I look forward to spending the time free from worries and concerns. I mean, who wouldn't want that? Do you have something that makes you feel this way? Walking, lifting, cycling, running...maybe even baking? Love this post. I've been thinking about why I run lately and want to start to do more than just running.